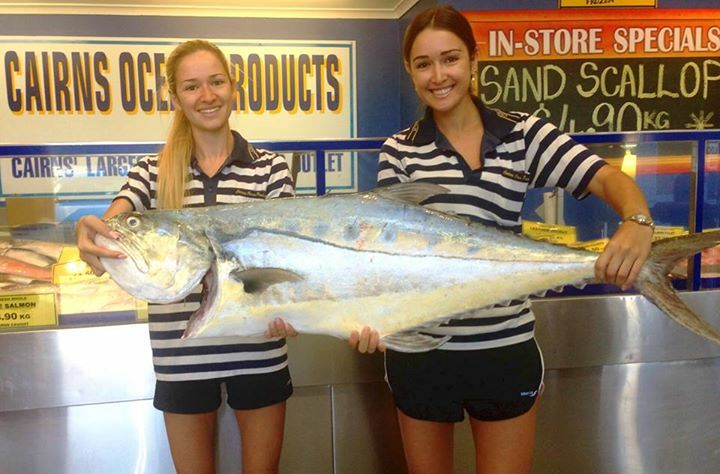 The queenfish or "queenie" is popularly known in the Northern Territory and other parts of tropical Australia as the "skinny fish" or "skinny". In other parts of the world, this species or closely related fish are also called leatherskin or whitefish. Several species or queenfish are found in our waters, although S. commersonnianus and S. lysan are by far the largest and most important. Queenfish are a tropical sporting fish. They have power, speed and courage and will leap repeatedly in the effort to throw the lure. The common queenfish (S. commersonnianus) is a long, fairly deep and extremely laterally-compressed saltwater and estuarine fish of tropical waters. Its typical colouration is typically dark green along the top of the back, and metallic-silver to silvery-white on the flanks and belly, sometimes with a yellowish tinge. A series of oval-shaped blotches forms a broken line along each flank. This tropical fish is rarely found in large numbers far south of the Tropic of Capricorn, although stragglers are sometimes taken in Hervey Bay and even Moreton Bay, in southern Queensland. They also turn up in reasonable numbers in and around Shark Bay, in Western Australia. The Queenfish inhabits coastal waters, often in schools. Smaller fish are found in estuaries and inlets, with larger fish being found offshore, usually near reefs and headlands. Habitat: Saltwater. Over the continental shelf, sometimes close inshore. Queenfishes belong to the trevally family (Carangidae). They are sometimes confused with another group of trevally species, the darts (Trachinotus spp). Taste, Texture Rather dry to eat. This exciting sport fish falls for live baits, dead baits, fish strips and pilchards or garfish on ganged hooks, as well as various lures and flies. With lures, the emphasis should be on movement and speed, which will excite the queenfish. Fast trolled or rapidly-retrieved sliced chrome lures, poppers, spoons, minnows and saltwater flies are all excellent choices. A wire or heavy monofilament nylon leader is advisable when pursuing queenfish, as their hard, sharp-edged jaws and small teeth can easily damage light nylon fishing line. Although sometimes denigrated in the tropics because of the ready availability of more "glamorous" table fish , queenfish have firm, white meat with an excellent flavour, although tending towards dryness. Smaller specimens are not generally popular because of the very thin fillets and excessive wastage. Queenfish should be bled and iced after capture. The flesh is rather dry to eat. With their firm flesh and good flavour, queenfishes lend themselves to a wide range of cooking methods including grilling, poaching, shallow frying and baking. Queenfish can be baked whole, or the fillets pan-fried or poached. In some Asian countries queenfish is dried and salted. Fillets of queenfish can be blackened, Cajun style, and served with a light salad of greens and pickled watermelon rind. They are also ideal for the barbecue but remember to score the flesh first. If using a dry heat method of cooking such as grilling, marinate the fish first or serve with a sauce. This will help limit the dry texture. Fishers in the fishery may operate from a mother boat with up to two dories. They may use any number or combination of troll lines, floating hand lines and rods. It is common for fishers to troll two to four lines behind a dory and up to eight lines from a mother boat. Using more than one licence, some operators use up to four dories with one mother boat. Most commercial fishers purchase bait (usually southern Australian garfish) for their fishing operations. However, a small number of operators fish for bait under a restricted bait net entitlement. Bait fish, usually garfish, harvested under this entitlement, may only be used for the commercial fishing of Spanish mackerel.